Oh, Napoleon Dynamite! What have you wrought? 88 min. Paramount Pictures. Director: Akiva Schaffer. Cast: Andy Samberg, Jorma Taccone, Ian McShane, Sissy Spacek, Will Arnett. Oh, Napoleon Dynamite! What have you wrought? The answer is yet another comedy about suburban nerd-dolts whose reaches exceed their grasps. Thanks to producer Lorne Michaels, writing-directing partners Andy Samberg, Akiva Schaffer and Jorma Taccone (all Saturday Night Live contributors) get their shot at the big screen in Hot Rod, a comedy that's a hybrid of one of their "Lonely Planet" viral videos and a Will Ferrell loser comedy (indeed, executive producer Ferrell developed Hot Rod before opting not to star in it). Raging loser Rod Kimble (Samberg), his stepbrother Kevin (Taccone), and buddies Dave and Rico (Bill Hader and Danny R. McBride) form a stunt crew that shoots amateur video of Rod's lame Evel Knievel-style stunts (Rod's costume: jumpsuit, fake moustache, wee cape). Verbally abusive stepdad Frank (the great Ian McShane) likes to subdue Rod in roughhousing matches, but one day Frank announces it's transplant or bust for his heart. Unwilling to let Frank go without beating him in a fight, Rod pledges to raise the required 50 grand: "I am gonna get you better, and then I'm gonna beat you to death!" In more proof that the supporting cast is overqualified, Sissy Spacek plays Rod's stepmother. The screenplay by Pam Brady (Hamlet 2) parodies '80s youth-culture adventures. In a rip from Footloose, Rod punch-dances out his rage (here, in a wooded glen), and there's a requisite "heart-tuggingly" complicated romance, with blithe sweetheart Denise (Isla Fisher). Hot Rod's at its best in short, surreal bursts, but they're all-too-infrequent. Before a stunt, Rod invokes spirit animals ("Totem spirit: fox"). Will Arnett turns up as an a-hole (quel surprise, but he's funny as always) and Chris Parnell as a guy convinced he can bring AM radio back. There's an in-joke scene that randomly parodies what actors learn in "Voice and Diction" class (pronouncing "what" as "hwhat") and a Lonely Planet-style interlude in which the phrase "Cool beans" temporarily hijacks the movie. But put all the funny bits together, and you get enough funny material for...a Lonely Planet video. Maybe two. 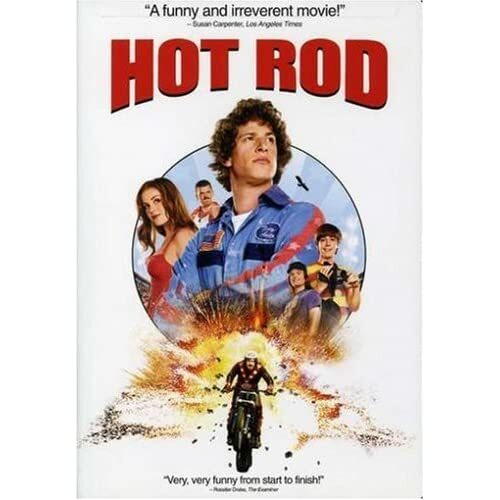 Mostly, Hot Rod is a low-ambition movie about high ambition. Paramount brings home Hot Rod on Blu-ray in a transfer that's marginally better than its DVD equivalent. With a soft, blown out, sometimes even blurry feel, Hot Rod can look like it was left out in the sun too long. But the first impression fades away a bit and once one gets used to the film's look, it's a not unpleasant picture. The Dolby TrueHD 5.1 surround mix is more impressive, pumping up sound effects to good, surprisingly immersive effect in the most active scenes. There's a nice selection of bonus features on the disc, as well, preserving everything previously released. First up is a commentary by director Akiva Schaffer and stars Andy Samberg and Jorma Taccone. The old friends and colleagues treat the commentary as a goof (ditto the featurette interviews that follow), but it's a good opportunity to get a sense for what it would be like to hang around these guys. "Ancestors Protect Me: Behind the Scenes of Hot Rod" (7:58, SD) is a blitz of behind-the-scenes footage and interviews with people acting like they're too high to focus. Taccone, Samberg, Schaffer, Isla Fisher, and Bill Hader participate. "Home Video Footage of Orchestra Recording Session" (1:28, SD) is exactly that, with Lonely Planet hanging around the sidelines and looking stunned that this many classically trained people are supporting their work. "Punch-Dance" (1:58, SD) offers a side-by-side comparison to the Footloose scene that inspired it. Eight in all, "Kevin's Videos" (4:23, SD) come uninterrupted with a "Play All" option, while fifteen "Deleted and Extended Scenes" (14:40 with "Play All" option, SD) come with optional commentary by Schaffer, Samberg, and Taccone. The "Outtakes Reel" (3:32, SD) features a collection of funny trims, and we get the "Theatrical Trailer" (:49, HD). Andy Samberg fans can rejoice in adding this Blu-ray to their shelves; others may wish to hold off. All site content © 2000-2019 Peter Canavese. Page generated at 04/24/2019 10:25:26AM.